This vibrant, protein-rich salad is a meal all by itselfbut truly perfect as part of a brunch or summer gathering. From The Pollan Family Table. This salad is a complete meal replete with heart-healthy ingredients and delicious fresh and savory flavors. To get the full spectrum of the Mediterranean diet, we love to pair this with a glass of red wine. In a small mixing bowl, combine the mustard, garlic, shallot, oregano, and thyme. Add the vinegar and lemon juice, and whisk to blend. Pour in ½ cup of oil in a slow stream and continue to whisk until emulsified. Add ¼ teaspoon of salt and pepper to taste. Season the tuna steaks generously with salt, pepper, and 1 tablespoon of the salad dressing. Cover and refrigerate for at least 30 minutes or up to 1 hour. In a small mixing bowl, combine the cucumbers, onion, 1 teaspoon of the parsley, and 1 tablespoon of the dressing. Mix well and set aside. Place the potatoes in a large pot; add water to cover by 2 inches and 1 teaspoon of salt. Bring the water to a boil and cook for 10 to 15 minutes, until the potatoes are fork-tender. Remove the potatoes with a slotted spoon (leave the water boiling) and place them in a small mixing bowl. Spoon on 1 tablespoon of the dressing, add 1 teaspoon of the parsley, and season with salt and pepper. Mix well and set aside. Fill a mixing bowl with water and ice cubes. Add the green beans to the boiling water and cook until tender, about 4 minutes. Drain the beans and transfer to the bowl of ice water until cool. Drain again and dry on paper towels. Remove the tuna from the refrigerator. Set a medium skillet over high heat. Add 2 teaspoons of oil and heat until smoking hot. Place the tuna in the pan and sear for 1 ½ minutes on one side. Flip and cook for an additional 1 ½ minutes (for rare). Transfer to a cutting board and allow the tuna to rest for 5 minutes. Using a thin, sharp knife, cut it against the grain into ½-inch slices. If the dressing has separated, whisk again to reemulsify. Place the lettuce, green beans, and the remaining dressing in a large salad bowl and toss. Arrange the greens on individual plates and top each with potatoes, cucumbers and their dressing, tomatoes, and olives. 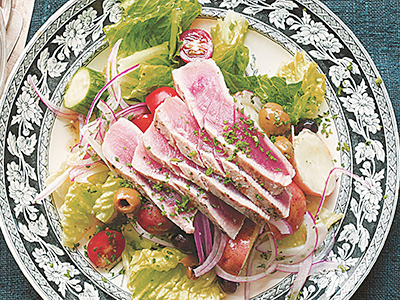 Place a sliced tuna steak on top of each salad. Sprinkle with the remaining 1 teaspoon of parsley and season with salt and pepper to taste. TIP: You can prepare your dressing up to 2 days ahead. Whisk it to reemulsify before using, or shake well if stored in a jar. Excerpted from THE POLLAN FAMILY TABLE by Corky, Lori, Dana, and Tracy Pollan. Copyright © 2014 by Old Harvest Way, LLC. Excerpted with permission by Scribner, a Division of Simon & Schuster, Inc.
A gorgeous, fully illustrated collection of recipes, cooking techniques, and pantry wisdom for delicious, healthy, and harmonious family meals from the incredible Pollan family—with a foreword from Michael Pollan. This stunning and practical cookbook gives readers the tools they need to implement the Pollan food philosophy in their everyday lives and to make great, nourishing, delectable meals that bring families back to the table. 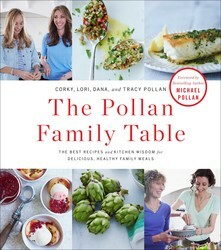 In The Pollan Family Table, Corky, Lori, Dana, and Tracy Pollan invite you into their warm, inspiring kitchens, sharing more than 100 of their family’s best recipes. Corky Pollan is the author of Shopping Manhattan, food blogger, the acclaimed Best Bets editor at New York magazine, and former Style Director of Gourmet magazine. Lori Pollan who holds an MBA, is a certified Life Coach with a focus on health and wellness, and cofounded the renowned Pollan-Austen Fitness Center with Dana Pollan, who cocreated and produced a series of exercise videos there. Tracy Pollan is an Emmy Award nominated actress who has appeared in television, film, and on the Broadway stage. She has served on the board of the Michael J. Fox Foundation For Parkinson’s Research since its inception in 2000.